GIM Templeton Global Income Fund Inc.
TDF Templeton Dragon Fund Inc.
ZF The Zweig Fund Inc.
Company: Venable Park Investment Counsel Inc.
With straight talk and real life stories, this book shows you how to protect your investments so that neither you nor your money are trampled by the myths and herd mentality of the marketplace. Investing can be challenging. Compounding the problem are the pressures that stem from the profit-seeking investment sales industry and the business media. In Juggling Dynamite, portfolio manager Danielle Park reveals the insider wisdom you need to build and preserve your wealth through the market cycles. Park explains how investors can benefit from understanding cycles, the cost of mutual funds, and the evaluation of stock prices. This book will equip you with the tools to make your portfolio grow using active investing and market timing. 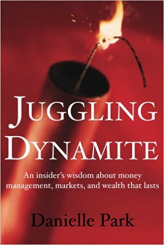 Juggling Dynamite will enable you to reach that elusive brass ring: lasting financial success. A realist blog on money management, markets, and wealth that lasts.